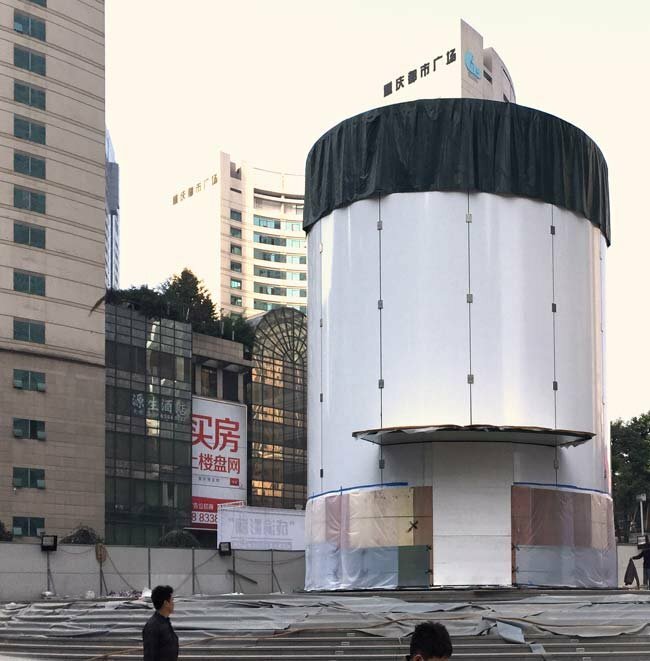 In the midst of a major retail expansion across China, Apple continues to make progress on its latest flagship outlet in the southwestern metropolis of Chongqing, recently breaking down the scaffolding surrounding the new store's dramatic cylindrical entrance. 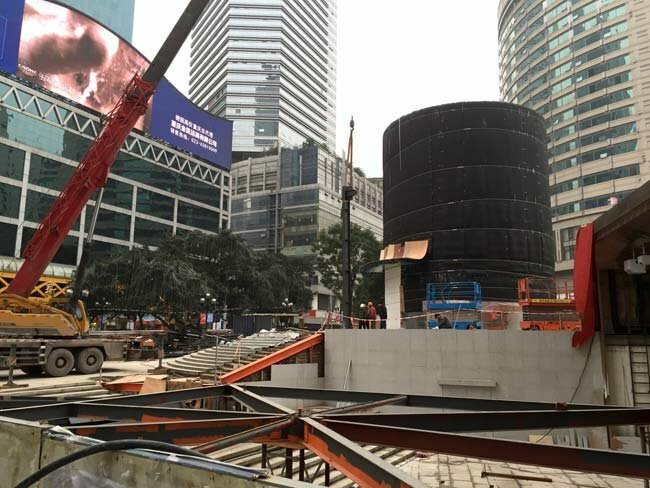 The all-glass cylinder appears to stand some 30 feet high, according to photos published by ifoAppleStore, and will likely hold a staircase and elevator for the seemingly expansive underground location. A similar entrance— said to be conceived by late Apple chief Steve Jobs— sits atop the company's Pudong store in Shanghai. The new outlet in Chongqing's Guotai Plaza will be the company's fourth shot at combining a cavernous underground space with an above-ground landmark, joining stores in New York, Shanghai, and Istanbul. Of those, only the Istanbul location does not feature a functional entrance in the above-ground portion. Apple has previously earned a patent on the glass cylinder design, suggesting that it is among the company's most treasured trademarks. Jobs is among the inventors listed on the patent. The opening date of the new Chongqing store is still unknown, but it will be quickly followed by a third outlet in the city that is currently under construction at the competing MixC shopping center. Apple is planning to triple its retail presence in China, an increasingly important market, under new retail czar Angela Ahrendts.